This is the latest accepted revision, reviewed on 7 March 2019. For other uses, see Tarp. A tarpaulin (US: /tɑːrˈpɑːlɪn/ tar-PAW-lin, UK: /tɑːrˈpɔːlɪn/ tar-PAW-lin), or tarp, is a large sheet of strong, flexible, water-resistant or waterproof material, often cloth such as canvas or polyester coated with polyurethane, or made of plastics such as polyethylene. In some places such as Australia, and in military slang, a tarp may be known as a hootch. Tarpaulins often have reinforced grommets at the corners and along the sides to form attachment points for rope, allowing them to be tied down or suspended. The word tarpaulin originated as a compound of the words tar and palling, referring to a tarred canvas pall used to cover objects on ships. Sailors often tarred their own overclothes in the same manner as the sheets or palls. By association, sailors became known as "jack tars". Tarpaulins have multiple uses, including as shelter from the elements, i.e., wind, rain, or sunlight, a ground sheet. Tarpaulins are often used during the build process to protect brickwork and masonry from weather damage. Tarpaulins are also used for a fly in camping, a drop sheet for painting, for protecting the infield of a baseball field, and for protecting objects, such as unenclosed trucks, semi-trailers or freight cars as well as wood piles. Such was the demand for tarpaulins by the New South Wales Government Railways, up until 1990, they operated their own tarpaulin factory. It is also used on outdoor market stalls to provide some protection from the elements of nature. Tarpaulins are also used for advertisement printing, most notably for billboards. Another historical use of a tarpaulin is to cover seats in a stadium that are rarely used, are in venues oversized for a venue, or are obstructed view seats in a multi-purpose stadium or indoor arena for a certain sport. The entire third deck of the Oakland–Alameda County Coliseum is also covered in tarp for Oakland Athletics games, but is uncovered for Oakland Raiders games, while portions of the upper deck CenturyLink Field in Seattle are covered with images of the Seattle Sounders FC crest or sponsor logos in games which do not require use of that seating. 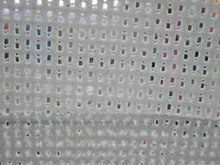 Perforated tarpaulins are typically used for medium to large advertising, or for protection on scaffoldings, the aim of the perforations (from 20% to 70%) is to reduce wind vulnerability. Polyethylene tarpaulins have also proven to be a popular source when an inexpensive, water resistant fabric is needed. Many amateur builders of plywood sailboats turn to polyethylene tarpaulins for making their sails, as it is inexpensive and easily worked. With the proper type of adhesive tape, it is possible to make a serviceable sail for a small boat with no sewing. Plastic tarps are sometimes used as a building material in communities of indigenous North Americans. Tipis made with tarps are known as tarpees. Tarpaulins can be classified based on a diversity of factors, such as material type (polyethylene, canvas, vinyl, etc. ), thickness, which is generally measured in mils or generalized into categories (such as "regular duty", "heavy duty", "super heavy duty", etc. ), and grommet strength (simple vs. reinforced), among others. Tarpaulins can also be classified by size—a common determining factor for consumers in acquiring tarps—and measured in width by length. Actual tarp sizes are generally about three to five percent smaller than the advertised size. (Thus, a tarp advertised as 20 ft × 20 ft (6.1 m × 6.1 m) will actually measure about 19 ft × 19 ft (5.8 m × 5.8 m).) Some other factors that may influence a purchase decision include color (often they come in blue, green, black, or silver), grommet type (aluminum, stainless steel, etc. ), and grommet-to-grommet distance (these often run between 18 in (460 mm) and 5 ft (1.5 m)). The weave count, a measure of tarp strength, often runs between (8 and 12 per square inch) and the greater the count, the greater its resistance against ripping in high wind conditions. Tarps may also be washable or non-washable and waterproof or non-waterproof, and mildewproof vs. non-mildewproof. Tarp flexibility refers to its ability to remain pliable during cold winter months; some tarps offer more flexibility than others in cold weather. Some manufacturers also advertise their tarps as "rot-proof", but this may be more a subjective than an objective measurement. A tarp is used to identify a business. A polyethylene tarpaulin ("polytarp") is not a traditional fabric, but rather, a laminate of woven and sheet material. The center is loosely woven from strips of polyethylene plastic, with sheets of the same material bonded to the surface. This creates a fabric-like material that resists stretching well in all directions and is waterproof. Sheets can be either of low density polyethylene (LDPE) or high density polyethylene (HDPE). When treated against ultraviolet light, these tarpaulins can last for years exposed to the elements, but non-UV treated material will quickly become brittle and lose strength and water resistance if exposed to sunlight. Canvas tarpaulins are not 100% waterproof, though they are water resistant. Thus, while a little bit of water for a short period of time will not affect them, when there is standing water on canvas tarps, or when water cannot quickly drain away from canvas tarps, the standing water will drip through this type of tarp. Polyvinyl chloride ("vinyl") tarpaulins are industrial-grade and intended for heavy-duty use. They are constructed of 10 oz/sq yd (340 g/m2) coated yellow vinyl. This makes it waterproof and have high abrasion resistance and tear strength. These resist oil, acid, grease and mildew. The vinyl tarp is ideal for agriculture, construction, industrial, trucks, flood barrier and temporary roof repair. Tarp tents may be made of silnylon. For years manufacturers have used a color code to indicate the grade of tarpaulins, but not all manufacturers follow this traditional method of grading. Following this color-coded system, blue indicates a lightweight tarp, and typically has a weave count of 8×8 and a thickness of 0.005–0.006 in (0.13–0.15 mm). Silver is a heavy-duty tarp and typically has a weave count of 14×14 and a thickness of 0.011–0.012 in (0.28–0.30 mm). Tarps have been used both within works of art, and also to conceal works of art from public view. A 2017 work called Tarp by Amy Malbeuf consists of a blue tarp with the word "tarp" written on it in glass beads. The work was created in reference to the use of tarps in improvised shelters by people who are homeless in Oakland, California. Native American artist Nicholas Galanin's 2018 retrospective art show Dear Listener at the Heard Museum included tarps as both elements of sculpture and as part of the gallery presentation. The sculpture Creation with Her Children, a collaboration between Galanin and Merritt Johnson, depicts Creation clothed in a gown made from a blue plastic tarp. While Creation carves her own face, her children, depicted as animals who have human hands, are gathered near her feet. According to the gallery text and the printed program, the tarp, which is "used heavily in indigenous communities," references "contemporary Indigenous life and the long standing effects of forced relocation under colonial rule." In one of the galleries housing Dear Listener, the skylights have been covered with blue tarps. The decision to do so was made by a museum curator in reference to the use of tarps in Indigenous North America as an inexpensive and widely available material used for building and repair. It also casts a blue glow on the room, and creates "a reminder that we live in a borrowed landscape, under artificial light and in air-conditioned spaces." Tarps have also been used to conceal art from public view, including statues of Confederate generals Robert E. Lee and Stonewall Jackson, an illegally placed bust of Edward Snowden, a fiberglass casting couch in a Hollywood mall that took on new meaning after sexual abuse allegations against Harvey Weinstein in 2017, and a sculpture of the founder of Halifax, Nova Scotia. Look up tarp, tarpaulin, or paulin in Wiktionary, the free dictionary. 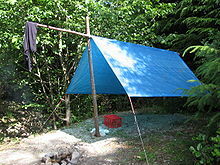 Wikimedia Commons has media related to Tarpaulins. ^ "Tarpaulin - Definition for English-Language Learners from Merriam-Webster's Learner's Dictionary". Merriam-Webster's Learner's Dictionary. ^ "tarpaulin - Definition of tarpaulin in English by Oxford Dictionaries". Oxford Dictionaries - English. ^ (Malcolm), Thorpe, M. (2010). Brickwork : for CAA Construction Diploma and NVQs. Level 2. Hodge, J. C. (John Charles). Oxford: Newnes. ISBN 9781856177658. OCLC 477290692. ^ a b c Printed program for Dear Listener: Works by Nicholas Galanin. 2018. ^ Hopper, Frank (10 May 2018). ""Those Are Sacred": A First-Person Account From the Tipi Demonstration That Shut Down Traffic". The Stranger. Retrieved 16 July 2018. ^ "Vinyl Tarps | Long-Lasting and Waterproof Grizzly Tarps". Grizzly Tarps®. Retrieved 2019-01-25. ^ Brown, Brandon (17 July 2017). "Reality Check: Oakland's Museum of Capitalism". Art in America. Retrieved 16 July 2018. ^ Duncan, Jenna (5 June 2018). "Nicholas Galanin's "Dear Listener" with Curator Erin Joyce". Java Magazine. Retrieved 16 July 2018. ^ Haag, Matthew (27 February 2018). "Judge Orders Tarps Removed From Confederate Statues in Charlottesville". New York Times. Retrieved 16 July 2018. ^ Brandom, Russell (6 April 2015). "A renegade sculptor has mounted a bust of Edward Snowden in a Brooklyn park". The Verge. Retrieved 16 July 2018. ^ Knight, Christopher (14 October 2017). "Hollywood & Highland censors sculpture in response to Weinstein scandal". Los Angeles Times. Retrieved 16 July 2018. ^ Willick, Frances (15 July 2017). "'Offensive and disgraceful': Protesters cheer as City of Halifax shrouds Cornwallis statue". CBC. Retrieved 16 July 2018.